ChiIL Mama : "ROCK-N-POP JUKEBOX" FEATURING 10 ORIGINAL SMASH HITS! "ROCK-N-POP JUKEBOX" FEATURING 10 ORIGINAL SMASH HITS! Some of the youngest members of Chicago’s music scene are ready to make a big splash with their first recordings. This year, students in Intonation Music Workshop programs around Chicago worked to write and record their own original songs, and the results will soon be available to music fans everywhere on the Rock-N-Pop Jukebox, Vol. 1! These ten tracks were written and performed by over 75 young musicians between the ages of 6-17 - many of whom had never played an instrument before they joined IMW. "It was really fun to actually go in to the studio and record this song we'd worked on, and to play around with it and make it sound cool," said 17-year-old Uriah from Neon Park, whose track "On Lock" is one of the album's highlights. "It gave me the the chance to do something I never got to do before." The songs in this jukebox are as sonically and stylistically diverse as the lives of the young musicians who created them. The collection is a soundtrack to the youth experience of growing up in the city, giving voice to the universal joys and pains we all experience while coming into our own. There’s something for everyone here: hooky pop confections (On Lock), hip-hop anthems (Owner’s Club), riff driven rock (Coming into me), old school doo-wop (Can You Tell Me Why), and even a slow jam (Angel) waiting for you at the end. Giving the project a professional look is acclaimed photographer Jim Newberry (Spin, Rolling Stone), who donated his time to capture a rockstar-quality photo for each band on the compilation. Check them out here. 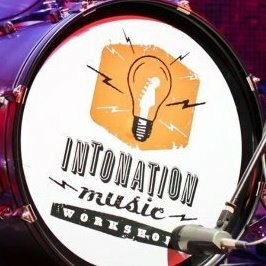 The Intonation Music Workshop is a band-based after-school music program with classrooms in some of Chicago’s toughest neighborhoods. Students are taught the basics of drums, bass, guitar and keyboards, then form their own bands and perform at venues as diverse as Lollapalooza, Millennium Park and the Bud Billiken Parade. The Rock-N-Pop Jukebox, Vol. 1 will give these kids more than a souvenir - it is tangible evidence of their hard work and dedication that they can share with family, friends, and music fans everywhere. The compilation CD will be available at the 3rd Annual Stars of Tomorrow Concert on June 9th at the CICS Bucktown School (2235 N. Hamilton in Chicago). This all-day music extravaganza will feature many of the bands on the compilations playing their tracks live! Of course, autographs will be available as well. The compilation will also be available for download through iTunes, Amazon, and all major digital retailers. SAVE THE DATE: 3rd Annual Stars of Tomorrow Music Fest Coming June 9th! June 9th will once again present a unique opportunity to check out the best of Chicago’s up-and-coming musicians when the 3rd Annual STARS OF TOMORROW SUMMER SPECTACULAR returns to CICS Bucktown at 2235 N. Hamilton. To celebrate the end of the school year and the beginning of summer, The Intonation Music Workshop presents this day-long, indoor/outdoor musical extravaganza for the whole family featuring a stellar line-up of 15 young pop groups, plus sets from Future Hits and Psalm One! You’ll also get family-friendly activities such as a Musical Petting Zoo, Rock Star Face Painting, Sidewalk Rock Chalk, decorate your own album cover craft zone, and more! So drop a coin, press shuffle-play, and enjoy the Rock-N-Pop! Check out Intonation's main site right here.